All activities involved in producing new bathroom fixtures impact the environment adversely. With bathtub refinishing performed by ecoTub Solutions, carbon footprints for individuals, hotels, apartments and government agencies are drastically reduced. Bathtub Restoration – Why Choose Us? ecoTub Solutions is your reliable tub restoration company in Hawaii. Be informed before you choose a bathtub restoration company or method. You can count on ecoTub Solutions to refurbish your tub, shower, and sink without harmful chemicals, odors, or waste. Most refinishers use acid etching agents that usually contain hydrofluoric, phosphoric or hydrochloric acid. These acids can cause damage to other surfaces, and the fumes are a potential harm to pets and family members. People with respiratory conditions or asthma are more vulnerable to exposure and the toxic gases can cause serious health problems for the elderly or children. With the increase in awareness of indoor air quality and the safety priority of hotel guests; many in the hospitality industry have taken the issue of fumes very seriously. Fumes from tub re-glazing can cause allergic reactions in many people for days after the work was done. If your tub cannot be restored naturally, we do offer a low-VOC option for bathtub coating. Replacement of bathtub or shower stall liners could be a viable alternative to refinishing because they can be replaced as needed. Unfortunately, liners can be costly, have a plastic appearance, and add more to landfills when they are replaced. DIY, or Do It Yourself, bathtub and tile refinishing kits have high failure rates and hazards associated with their application. The worst problems are the mess and subsequent peeling. Once it has begun to peel, the finish needs to be stripped before the surfaces can be refinished again. Having a professional refinisher redo the work adds even more cost to the project. 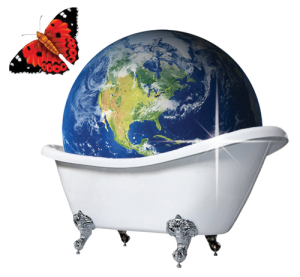 ecoTub Solutions can help you do your best in reducing your carbon footprint as your best green alternative to bathtub refinishing. 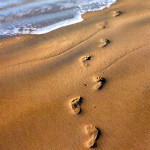 The term “carbon footprint” is a measure of the impact human activities have on the environment in terms of the amount of greenhouse gases produced – as measured in units of carbon dioxide. ecoTub Solutions offers bathtub refinishing services because one of the best green remodeling alternatives to replacing old fixtures with new ones is simply making the old look new again. ecoTub Solutions believes in saving money, time, landfill space, and the environment. With our green bathtub refinishing, older working fixtures are cleaned on site, saving more junk from dumps and landfills. It was estimated that in the U.S., the waste coming from construction and demolition debris account for 20% of all landfill waste; 43 % (58 million tons) of this total is from residential construction, demolition, and renovation projects. Disposal costs are high, resources are needlessly wasted and we are running out of landfill space. Bathtub refinishing is therefore helpful in saving the environment. The creation of new landfills is limited, especially in Hawaii where our land and resources are immensely precious. Repair. Restore. Reuse. ecoTub Solutions can help you have beautiful bathroom fixtures in an Earth-friendly way!